Spill is the Berlin-based duo of Magda Mayas on piano and clavinet and Tony Buck on drums / percussion, formed in 2003. Releasing their 3rd album this year, Tony and Magda have been playing all over Europe, the USA, Australia and Lebanon. Tony Buck is regarded as one of Australia’s most creative and adventurous exports, with vast experience across the globe. He has been involved in a highly diverse array of projects but is probably best known around the world as a member of the trio The Necks. Following studies and early experience in Australia he spent time in Japan, where he formed PERIL with Otomo Yoshihide and Kato Hideki before relocating to Europe in the mid-nineties. Some of the more high-profile projects he has been involved with include the band Kletka Red, and touring and recording with, among others, The EX, The Exiles, and Corchestra, and involvement with most of the international improvisation and new music community and festivals He also creates video works for use with live music performance and has had pieces shown in Tokyo, Belfast, Berlin, New York and Sydney. Current projects include TRANSMIT (a guitar driven post-rock project); New York based trio “Glacial” (with David Watson and Lee Renaldo); “The Fell Clutch” (with Ned Rothenberg, Stomu Takeshi and David Tronzo) and a long-standing duo with Axel Dörner. Magda Mayas is a pianist living in Berlin. Developing a vocabulary utilizing both the inside as well as the exterior parts of the piano, using preparations and objects, she explores textural, linear and fast moving sound collage. Alongside the piano, Mayas has recently been performing on a Clavinet/Pianet, an electric piano from the 60s with strings and metal chimes, where she engages with noise and more visceral sound material, equally extending the instrumental sound palette using extended techniques and devices. Mayas performs internationally solo and in collaboration with a large number of musicians and composers. Current projects are a duo with Anthea Caddy (cello), a duo with Christine Abdelnour (sax), and “Great Waitress”,a trio with Monika Brooks (acc) and Laura Altman (cl). 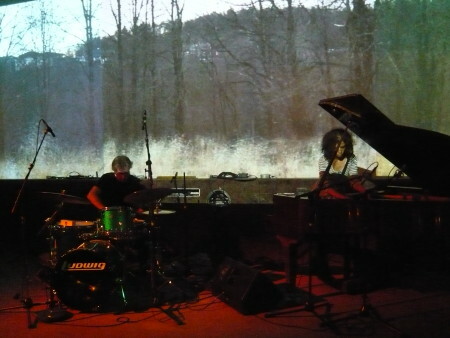 Magda Mayas has performed and toured in Europe, the USA, Australia and Lebanon and collaborated with many leading figures in improvisation and composers such as John Butcher, Andy Moor, Zeena Parkins, Joelle Leandre, Paul Lovens, Ikue Mori, Phill Niblock, Peter Evans, Andrea Neumann and Axel Dörner. Opening is Seattle duo Bad Luck, the 10-year collaboration between Seattle-based musicians Chris Icasiano on drums and Neil Welch on saxophone/electronics. With four albums under their belt, Bad Luck has created an incredibly diverse array of music — no small feat in the heavily trodden world of drum/saxophone duos. Their melodies, improvisations and compositions are constructed from the ground up, creating a band sound much larger than the sum of its parts. Bad Luck formed out of late night drum and saxophone marathon sessions exploring Coltrane/Rashied Ali style duos and jazz standards. It was after adding live electronics that the unique sound profile of Bad Luck began to take shape. Welch and Icasiano are founding members of the famed Racer Sessions avant-garde performance series which takes place each week in Seattle. They are also founding members of the cutting-edge arts organization Table & Chairs, which produces music events and facilitates educational programs. Bad Luck tours extensively, having shared the stage with local bands throughout the US as well as major figures in improvised music such as the saxophone legend Roscoe Mitchell, and performers Cuong Vu, Andrew D’Angelo, Wayne Horvitz, Dave King (The Bad Plus) and Chris Speed. Tony Buck & Magda Mayas are supported by Villa Aurora as current artists in residence.